Mix garlic, 2 Tbsp. dill, 1 Tbsp. lemon zest, 1 Tbsp. lemon juice, 1 Tbsp. oil, 1 1/2 tsp. kosher salt, and pepper in a small bowl with a fork to create a paste. Pat pork tenderloin dry and rub with paste. Heat 1 Tbsp. oil in a large oven proof skillet over medium-high. Sear pork, turning occasionally, until golden brown on all sides, 10–12 minutes. Add tomatoes, then transfer to oven and roast until an instant-read thermometer inserted into the thickest part of pork registers 145°F and tomatoes are lightly blistered and softened, about 10 minutes. Transfer pork to a cutting board and let rest at least 5 minutes before slicing. Meanwhile, whisk remaining 1/4 cup olive oil, 2 Tbsp. lemon juice, and 1 tsp. kosher salt in a medium bowl. Add arugula, farro, peas, feta, and remaining 3 Tbsp. dill and 1 Tbsp. lemon zest; toss well to combine. Gently fold in roasted tomatoes. Slice pork and transfer to a platter; season with sea salt, if using. 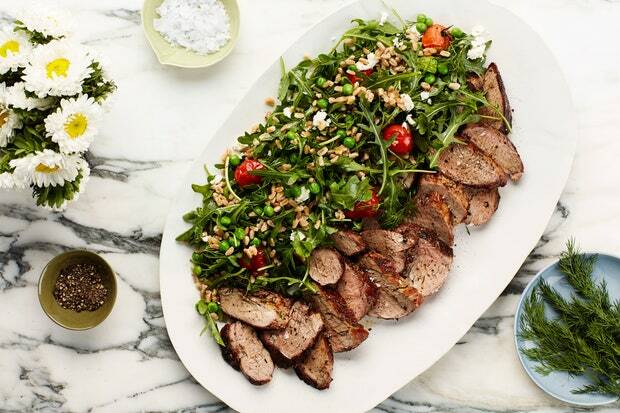 Serve with farro salad alongside. By aggiejac in forum What's For Dinner?